My guest today is Carol McGrath. Carol has an MA in Creative Writing from The Seamus Heaney Centre, Queens University Belfast, followed by an MPhil in Creative Writing from University of London. The Handfasted Wife, first in a trilogy about the royal women of 1066 was shortlisted for the RONAs in 2014. The Swan-Daughter and The Betrothed Sister complete this best-selling trilogy. The Woman in the Shadows, a novel that considers Henry VIII’s statesman, Thomas Cromwell, through the eyes of Elizabeth his wife, was published on August 4th, 2017. Carol is working on a new medieval Trilogy, The Rose Trilogy, set in the High Middle Ages. She speaks at events and conferences on the subject of medieval women, writing Historical Fiction, The Bayeux Tapestry, and Fabrics, Tapestry and Embroidery as incorporated into fiction. Carol was the co-ordinator of the Historical Novels Association Conference, Oxford in September 2016 and reviews for the HNS. Find Carol on her website, Facebook, Pinterest, Twitter @carolmcgrath and her blog, Scribbling in the Margins. Thank you, Elisabeth for inviting me to your blog. It is a privilege to be here. You ask me about other novelists who have inspired my writing. I am an avid reader. As a teenager I adored the stories told by Anya Seton. My favourite was Katherine. I loved The Black Arrow by Robert Louis Stevenson and The Rider of the White Horse, a Civil War novel by Rosemary Sutcliff. Thomas Hardy is a superb lyrical writer with a sense of place. Pasternak’s Dr Zhivago, a novel about the Russian Revolution has a great love story. The Name of the Rose by Umberto Eco is unsurpassable. Gabriel Garcia Marquez’s writing is inspirational also. These authors write memorable characters and possess wonderful writing styles that even come through in translation. 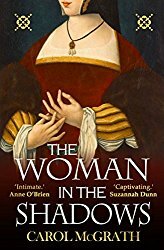 The Woman in the Shadows is influenced by Wolf Hall, my own interest in women’s history and in the history of Tudor London. I wanted to know more about Cromwell’s early career and his home life. I have always enjoyed researching and writing a woman’s history, and looking at historical events through their eyes. In this book, I explored the Tudor London Merchant class because Elizabeth Cromwell came from a family of wealthy cloth merchants. She was a young and wealthy widow when Thomas Cromwell married her. This novel tells her story through her daily life and her marriage to an ambitious man. Elizabeth inhabits the shadows of Wolf Hall. I thought to bring her out of the shadows and allow her a plausible story. More inspired by an idea than by a particular historical era, as a writer I refuse to be pigeon holed into one era. I was a history teacher before writing novels, thus possess a wide interest. My favourite era, and one I studied in detail at University, contains an event I have not as yet written- The English Civil War. The seventeenth century is a period in waiting. I also studied and enjoy the medieval era, of course. I like its colour, pageantry and edginess. The ‘mind set’ before the Renaissance is really fascinating but quite worrying too. Best way to write it is to send the men off to war and make the women custodians of manor or castle! In a war situation women could have more freedom, face incredible dangers and were thrown on their own resources. I research in the Bodliean Library in Oxford using both primary and secondary source material. I like hearing actual voices from the past. My research books inhabit many shelves. 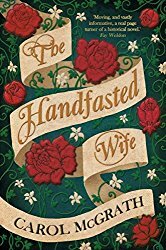 It took two years to research and write The Woman in the Shadows and five for The Handfasted Wife. With the latter, I was on an MPhil programme at London University when I wrote a 40k word thesis on How Romance Tempers Realism in Historical Fiction. If I find a sentence or phrase difficult, and often do, I substitute but think about it and return to it later. Poetry is great for language. I find Seamus Heaney inspirational. He was also one of my early teachers at University. I tend to write best in the Greek Mani where I have a cottage with a view of the sea and which is covered with bougainvillea. The Peloponnese is an old world and utterly inspiring. It is quiet and tucked away from distractions. I think I usually spend around a quarter of a year here writing. I look at lots of photographs and paintings. I have Pinterest boards for all my books too. I love studying detail such as footwear and fabrics in seventeenth century Dutch paintings and Renaissance Art. 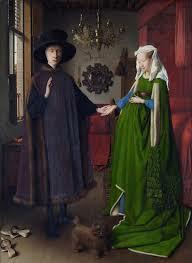 My favourite painting is The Arnolfini Marriage by Jan Van Elyck, 1434. Do you use a program like Scrivener to create your novel? I very often write in long hand first, chapter by chapter, not always but enough. I have never used Scrivener though am thinking about it. I plan in three or four parts and then break that down. I keep a chapter plan with a grid for characters with names and details like eye colour etc. and for each chapter thrust, POV, page number beginning and also the number of words in the chapter. You can make up a grid to suit you and use it as you write. It makes it easy to find details later. I keep my research in notebooks and love my notebooks. Advice. New writers, a first draft is a beginning. The future drafts are where the real work lies. That can take longer, much longer, and though it might seem tedious at first, since when you change one thing other bits change but it can be a pleasure too. Never ever send out to agents until you have a really good full manuscript. Make sure it is as good as you can get it. If you can get a professional critique do get it. Structural edits matter. Have an ending before you begin, even if it changes. Know your characters. I write into a novel a little first before planning in three or four acts because I really do need to get its feel. It is the characters’ journey that a reader usually wants most. Each act should have a crisis- cause, crisis, effect and solution and another crisis can soon arise, sometimes though not always connected to the first. These crises can be dramatic, emotional or simply quiet. Colm Tobin does quiet well, as does Sebastian Barry. It is the unknown that generally makes us turn pages. My next book, The Silken Rose, is set in the magnificent thirteenth century. It is the first book in a trilogy. The Silken Rose tells the story of Provençal Queen Ailenor of England and Eleanor de Montfort, King Henry III’s sister. Ailenor is determined to preserve family and throne in the face of adversity. Eleanor de Montfort is loyal to her husband who emerges as King Henry’s enemy. 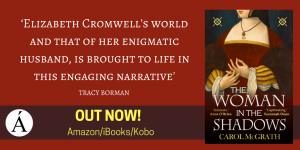 A powerful, evocative new novel by the critically acclaimed author of The Handfasted Wife, The Woman in the Shadows tells the rise of Thomas Cromwell, Tudor England’s most powerful statesman, through the eyes of his wife Elizabeth. You can buy The Woman in the Shadows on Amazon UK and Amazon US. 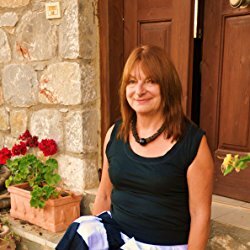 Find out more about Carol’s books on her Amazon page. Thanks so much for joining me on Triclinium, Carol. Good luck with your wonderful new book. Interested in learning the inspiration behind other novels? Subscribe to my Monthly Inspiration newsletter for giveaways and history – both trivia and the serious stuff! You’ll also receive an 80 page free short story. I’m looking forward to reading this book. I have to say that after watching Wolf Hall, I found Thomas Cromwell and his wife, children and young proteges, to be more interesting than I had previously thought. I had thought of him as an ambitious, cold hearted figure. Wolf Hall “fleshed” him out. Elizabeth must have been a strong personality to have been married to such a man, so it will be nice to read about HER and see HER as a more complete human being, rather than a shadowy figure. Looking forward to this book. It’ so nice to read about characters you know of but often are just in the background. Great interview. Look forward to reading it. I just finished reading a book with Cromwell in it. I love to read historical stories and would welcome a copy of this book. It sounds really interesting. This book looks great and I love the cover. I always enjoy reading interviews with authors to hear how they plan and write their books. My favorite historical period is the Civil War also. Super interview! I found it very interesting that a book she really loved growing up was the same one that inspired my love of historical fiction, “Katherine” by Anya Seton. The Tudors continue to give life to the world of historical fiction. I’d love to know more about Elizabeth Cromwell and her circle, please enter my name in the draw. Thanks. I love Tudor England. Can’t wait to read this! Henry XIII & his wives were books that I couldn’t get enough in high school (which is MANY moons ago)!!! Love historical fiction & would dearly Love to win this drawing! I loved the interview. you learn so much. The book sounds great. It sounds like another fascinating historical novel about yet another woman in the shadows. Looking forward to reading it! I really enjoyed the ‘Hand-Fasted Wife’ and the rest of the 1066 trilogy. It was fascinating to read about the possible women’s role during that time period. I have read a number of books about the Tudor dynasty and would be most interested in reading about Elizabeth Cromwell. Please enter me into the drawing. I really appreciated your thoughts on structure. I’m finding that Woman of the Shadows has an elegant pace. I also agree, Colm Toibin is magnificent. I look forward to when you take on the 17th Century. 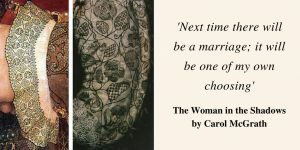 I have loved Carol’s other books and I am sure I will love this one too. So glad this book is about a lesser known personage during the Tudor era.